There is a step above the “handmade look”. 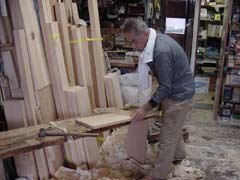 Chisel and plane are the only tools used by the master “daiku”: yet he creates a perfectly square, smooth sculpture. No sealants or caulking are used but the masterful joints are invisible. There is no need for outspoken pride or rhetorics: this is the essence of perfect handwork. Who said that “handmade” has the downside of being rough? Why shouldn’t “natural” be long-lasting? Is it possible to have a “healthy” bathtub which is also beautiful and practical? 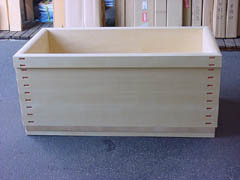 A hinoki tub is a masterfully built, smooth, natural and healthy, an easy-to-install and to maintain solution for your home: a WIN – WIN situation. 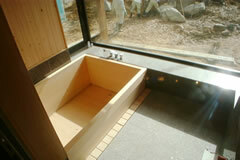 Within a Japanese soaking tub, we can find represented many concepts of the Japanese way of seeing the world. Complex details, multiple functions, technological inventions, influential styles and even historical conflicts can be all present, in a perfect balance, in the apparently simple line of an invisible wood joint. An ofuro is something that a plumber has never seen and therefore “HOW DO I INSTALL IT?” is probably our top frequently asked question. Installation is very easy, actually our recommendation is … not to install it at all! 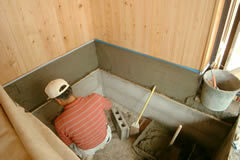 In japanese bathrooms, there is a floor drain and the floor and lower part of the wall is waterproofed and tiled. If you have a bathroom built this way then the installation of the tub is the simplest of things: just place it on the floor! Surprised? Well if you think about it makes a lot of sense: When you shower the water falls on the floor and from there flows towards the floor drain. In the same way, when you take a bath, water may overflow from the top rim and when you empty it the water will flow on the floor and towards the floor drain. What is wrong about that? 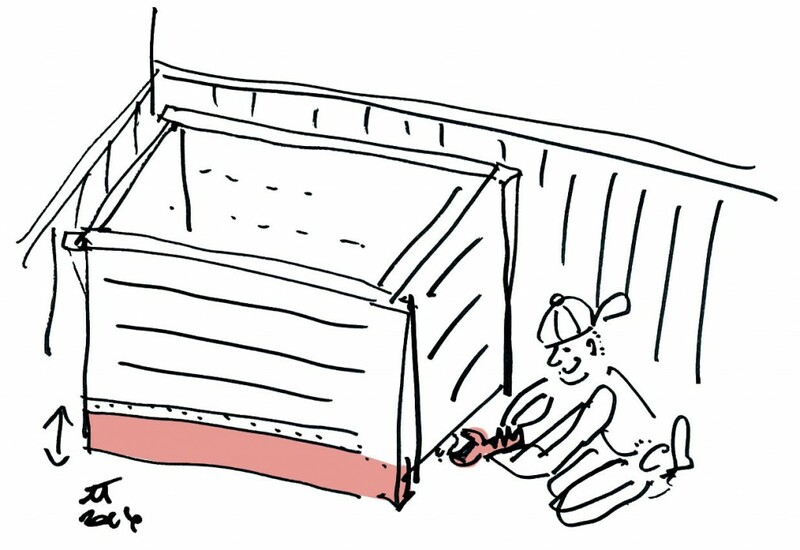 Basically the ofuro is just like a large bucket placed on the floor without need for a plumbing connection. Another advantage of this configuration is that you can easily move the tub for maintenance or cleaning. If you are worried about the water spreading on the whole bathroom area, you may install a flexible hose attached to the drain. Just plug the edge into the floor drain. This way the water from the tub will drain directly and the overflow / water from the shower will be picked up by the free section of the floor drain anyways. If you cannot waterproof the whole bathroom, just create a ditch or install a standard waterproof pan (like a shower drain pan under the tub. 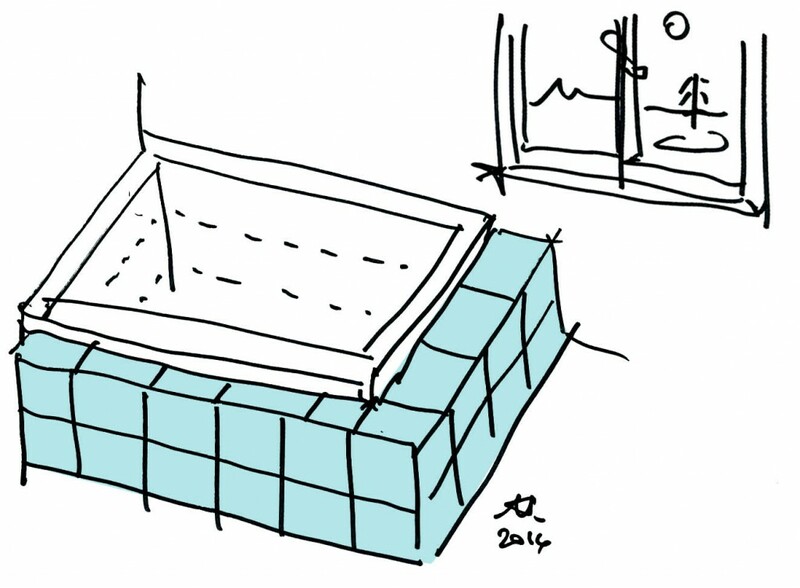 The drain pan can have a low rim (at least 50mm) or come up to the ledge of the tub (built in layout, like in the sketch above). Of course in this case the tub does not need any hard plumbing connection. Just slide the ofuro inside the drain-pan and you are set to go! If you are not convinced of the above, or if your plumber is hard headed, you may go for a …hard connection! Our drains are compatible with both metric and imperial fittings. (see here the detail of our standard socket). Since there is little space under the tub to tighten the nut, we can make a higher base for the tub so please let us know in advance. 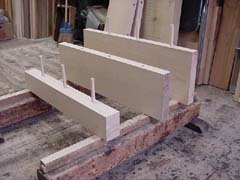 For timber framed houses the connection is often made from the ceiling below or from the basement. Of course the disadvantage of this situation is that the tub cannot be moved freely. 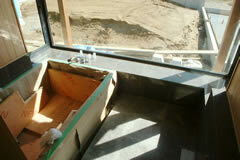 Also, often the tub is raised up to make the drain connection: which makes it more difficult to enter/egress. Another note for hard-headed plumbers: our ofuros do not come with certifications like ASME etc. 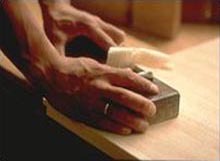 The wood is cut as per the required sizes, eliminating soft areas (young layers) and knots, respecting the direction of the grain. 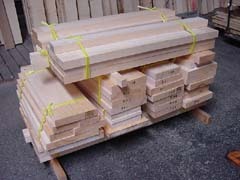 The wood is planed to remove the imperfections and bring it to a uniform thickness. 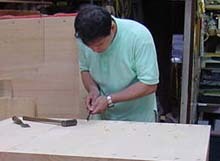 With a technique borrowed from boat construction, two planks are partially overlapped and hand sawn: so the adjacent boards are originated by a single cut and can match perfectly. 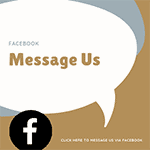 After our answer by email, feel free to ask everything that concerns you by email or telephone. You can contact us in english, japanese or italian. You can telephone us, anyway e-mail may be more convenient because of time difference and not native pronunciation. After your positive response, we will prepare drawings and send to you in pdf format. Please review carefully, expecially sizes. When all matters (cost, drawings) are defined, you are ready to order. We will require at least 50% advance payment on custom items (accessories, transport are payed 100% together with the balance) to confirm the order and start manufacture. All payments should be done through wire transfer to our bank accounts in Japan (Minato Bank Corporation or Bank of Tokyo-Mitsubishi-UFJ.) and all bank charges (30~50 US$) should be settled by the payer. Manufacture takes between 10~30 days, according to workload and complexity of the item. Once completed, we will send photographs for your review and approval and will require payment of the balance before shipping. 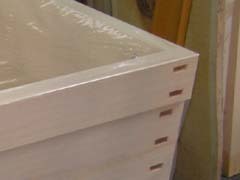 After receiving the balance, we will ship the tub as agreed (air or sea)and will promptly forward you the shipping documents. You will be contacted by the agent of our forwarder and the tub will be delivered on site. 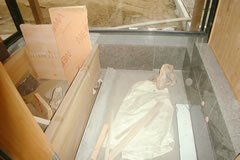 It is VERY IMPORTANT that you put back the protective plastic wrap until ready to install. 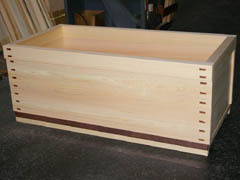 Have your carpenter install the tub and fill it up to the edge. Enjoy the bath. Leave it full for few hours the first time to allow wood to reach the ideal humidity level. On this page you will find some of the commonly used terms and descriptions to help you finalise your ofuro order. 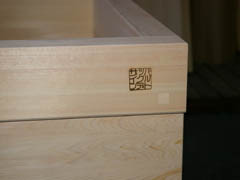 The 42mm thick hinoki slabs are joined in such a way that the more permeable head of the plank is completely protected. 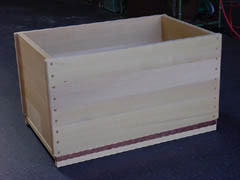 For tubs wider than 800mm, it is necessary to strenghten the top with a 60mm thick frame (kamachi). the copper oxyde has a fungicidal action. For a lighter, more natural look we can treat the bottom plank head with natural oil by Kreidezeit. In modern bathrooms this area is not so severely exposed to rot like it used to be in ofuro of the past. Wooden wall panelings are popular with hinoki tubs but we recommend a 10cm protection above water level for easy maintenance. 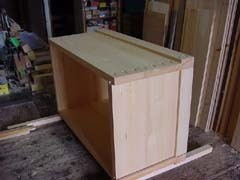 The bathtub is shipped in one piece and is ready for installation. It should be left on site for at least 24 hours before installation. 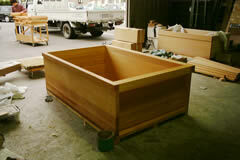 The hinoki tub is set in place: it can be fitted in tight or leaving a gap from the perimetral walls. See the FAQs. The tub does not need caulking but it can be sealed if you prefer. Protect until tile grouting is completed. Just fill it up and enjoy life! 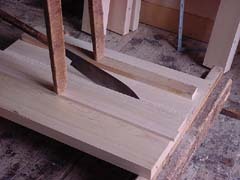 Wood plugs are used to compose the top border (kamachi) with the 2 lower sections of one side. 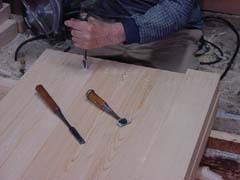 Rectangular (or round) holes with a stiching pattern are hand-cut on the head of the long sides with the aid of a chisel. 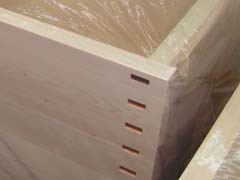 Tongue and groove joints are prepared on the heads to ensure solidity and to create a definitive barrier to water leaks. 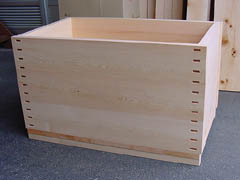 The 4 sides and the bottom are assembled. 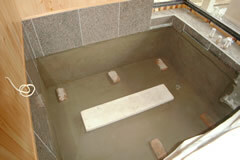 We use stainless screws to reinforce the baht-tub while keeping them invisible. reason, you will need to contact us for a detailed quotation. Please go thru this checklist before placing an information request. did you read the ordering summary and order process pages? can you wait 40~60 days? 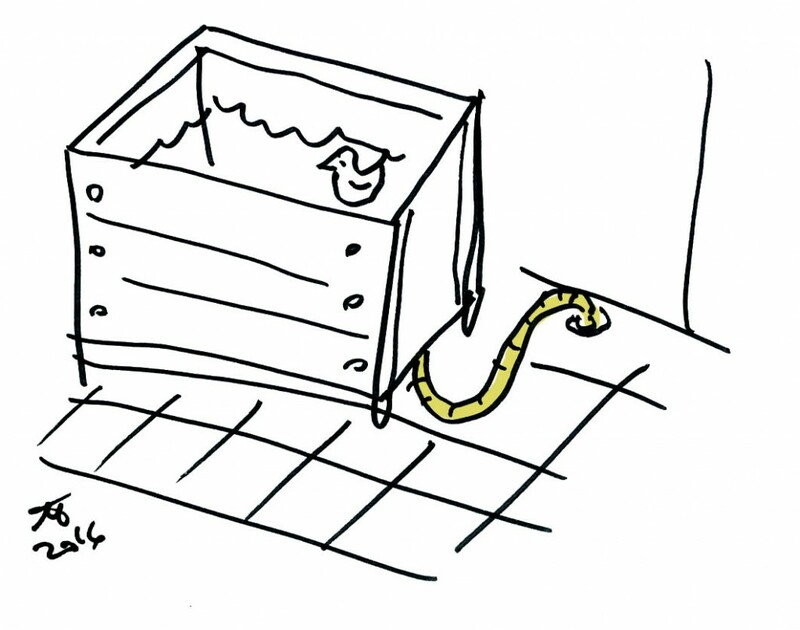 it takes us several hours to draw and quote your bathtub. Are you seriously motivated? are you ready to equip the bathroom with an hygrometer to check periodically the relative humidity of air? if possible fax us a plan of your bath area so we can advise. please let us know desired shape, sizes (external) in millimeters. Do you want to use Knotty hinoki? Straight hinoki? Asnaro wood? do you want a solid looking top frame (more expensive) or a minimalist box-like shape? do you want the bottom base to be with copper plate or oil treated? 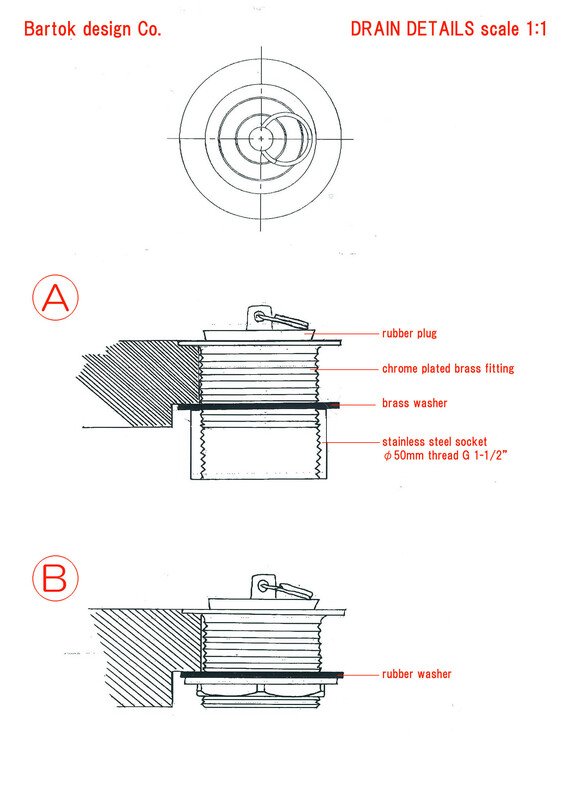 do you want the joints to be with round plugs or square copper plates? do you want a straight back or slanted back? do you want a built in bench? spout? tub cover? accessories? do you want us to install the drain fitting or just supply it and have you drill it in site? unless differently specified, we will iron brand the Bartok design Japanlogo on the top right side. 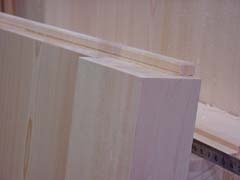 The 42mm thick hinoki slabs are joined in such a way (T-joint) that the more permeable head of the plank is completely protected. The “dabo” is a good choice for a softer, natural look. 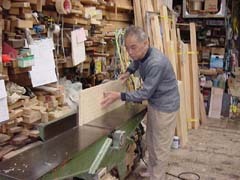 Technique typical of the Tokyo (Edo) area. Each plate covers a long stainless steel screw which solidly connects the front with the side planks. 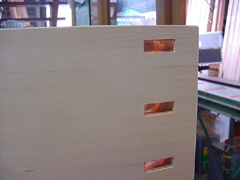 We cover the joints with a copper plate "kugikakushi", the original technique developed from the ship construction. The copper turns green aftertime. We apply a hot-iron seal with our brand logo. Usually we propose to place it on the long side, towards the top right corner.